This web-pages are created, to memorize this great president of Ghana, who always, put the people of Ghana first, before anything else! My dear Vice President, I want to congratulate for the support you are giving to our president. May God bless you for being faithful all this while amidst the trials. I to encourage you to stand firm don't be dismayed by what is going round God is the ultimate He will surely see you through. just trust Him and keep doing what is right and He shall also elevate you to hights. May God Almighty keep you save. Victory is yours forever. Thank you for giving time. May the Almighty God be your Guide. I think we can develope as a nation,if we try to fight the coruption people on our streets. working,i guess.And we can not fight corruption if we do not sort out the justice system first. Lut's stop buying people and start embracing trueth.Thanks Mr. President. deaer president please do something about the oil problem for us.and never mind what that man is doing i mean jj. MY dear president, may God richly bless you for your leadership style. Sir, I hope all is well with you. I want to find out why compensation for the property destroyed during the construction of the maamfe-pantang highway has still not been paid four years after completion. I'm a poultry farmer and i know you know first hand the crippling crisis poultry farmers are facing in this country so to have our warehouse and other buildings destroyed and to be still waiting for the compensation after 4 years has been quite difficult to say the least. We are down to a third of our workforce and capacity but because of our Ghanaian spirit we will continue to strive. We are not the only ones affected so Sir I'm writing to you in the hope that you might inquire from the Ministry of Roads and Highways and the Ministry of Finance about our plight. I know you are very busy but I know you also have your citizens best interest at heart. Thank you for your time and have a great day sir. Great job done soo far and i believe strongly that you are going to win the next election. Please Mr. President, the bible say "to Abraham was the promise, God foreseeing before hand preached the gospel saying 'for the seed of Abraham shall be a blessing to all nation'. The bible continue to say that "To the heir as far as a child is a slave until the fulness of the time has come". Is it possible for father to give his son an inheritance, which later on he will come and still be demanding for that same inheritance which he has given to his son? You may quiet agree with me that it is not possible. So Mrs Rawlings was once my grandmother and my grandfather Mr. Rawlings and by then my father Atta Mills was their son. then why did they want to take back what was given to their son.Please we the children of their son are watching them so let's do the right at the right time. As he was a son while still a child is a slave and now as the liberty was given to him by the father let him use his liberty as it can benefit him. 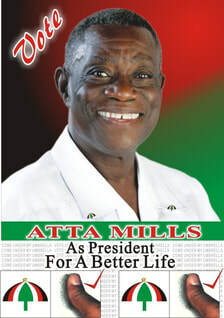 Atta Mills You are the man of Perfect peace apart from you is God just that Ghanaian are blind folded not to recognise the light of God in you but God know it in the best way than i know. Mr president Ghana need you so much so try and look at the people well others are always hypocrite they will laugh with you but will always run whne there is problem, the road to Amanse west is in deplorable state meanwhile various galasey operation has taken over the town water bodies, there are only few bore hole that work, i hope the DCE will use his right judgement to help maintain the road, ensure that galamsey operation do not destroy the water bodies and give the people life to live. Salaamu alaik His Excellency,how can i become like you. I'm a concern Ghanaian living a Spain, intended to send you this information and presentation of a company called Geo Solutions.This company works under ministry of energy, They changes (refuse) Waste to Electrical Energy. Knowing very well all the electricity power challenges in Ghana, I presume these idea when accepted might go along the way to help to augment the existing facilities. I've spoken with them and finally they have accepted my petition with interest to establish in Ghana. More information's, proof and documents are available. Your Excellency I'm disposable to help improve the better Ghana agenda. I will be very delighted to hear from you, your interest and involvement in these development. Please revert as early as you can. Good Evening Mr. President, As we enter the season of primary and national elections, please explain to the people that you have tried very hard to satisfy as many people as possible both inside and outside the NDC, over the past two and half years. Those who have not been served should wait patiently for the their turn, they would also be served. Please also explain to the NDC faithfuls that we lost power in 2000, because the people said they needed a change. A close listening to the voice of the people shows that they needed a change from the politics of violence, intimidation, arrogance, overburdening ego of the NDC leadership, vengeance, vindictiveness, vendetta, disrespect for the people of Ghana both inside and outside the party. While you remain committed to the ideals of accountability and probity, the NDC needed re-branding and it was that re-branding with a new posture of humility, peace, rule of law, freedom from the aforementioned vices and focus on the real needs of the people that brought us victory. We need to stick to this new branding, which the people of Ghana and the world over are looking for. Let's remember that the former type of leadership and politics is being chased away everywhere. The prophecy is that "Fear not because God has given you an open door that no one can shut because even in your weakness, you have kept his word and not abandoned his name"(Revelations 3:8). Mr President, I salute you in the name of the Almighty God that we serve. I would like to congratulate you on the good works that you are doing.Building a nation is not a day's job but please check the corruption. The corruption at the various the ministries is just too much. Please just send Anas to do an under cover work and you will be amazed at the results. I am a student in one of the universities and studying information technology. There certain issues bothering me and I think the perfect place to share them is on your official page. Mr President, the first is about the laptops that are supposed to be given to the pupils for use. Don't you think Mr President, it will be a disgrace to some of the teachers since they don't even know anything about this machine called the laptop. Assuming a pupil faces problem in its usage and approaches his/her respected teacher who has no idea about it, don't you think the pupils will look down on these teachers? My second point is about the teacher's salary. I was a teacher before leaving for school and it was because of the salary. Please do something about the salary. My special appeal to you is this, I need monetary assistance. I just lost my laptop and I need some money for school as well. I will also like to help in training the teachers who have no computer knowledge before the laptops are shared to the pupils. Good day, I am calling from Larabanga. May Allah richly bless you. Never mind who ever is insulting you. please a leader of today carry no respect but insult. However, I know your capability,what you can do and what you have been doing. So is not any body who can appreciate the efforts of you. I will say Asalamu alaikum warahamatul lilah. Please I notice a problem in Ghana that the president could solve for common advantage and appreciation. Please if you read this email indicate it to my email and I will post the very private email to a given email or to this very one if it is the only option. Good Morning Mr. President, I have a simple message for you. We are in an era when leaders who invoke fear and terror in their people and overburden them with their over inflated ego are being chased out by the masses and are being spewed out by the spiritual universe. We are in an era when the masses are forcefully demanding accountability from leaders in terms of improvement in their living conditions first and foremost. In short we are in the era of the masses. By the grace and guidance of God, you have chosen the perfect style of leadership that is suitable for the epoch. Please keep it up and never deviate from this style of leadership. Just remember also that the righteous in the way are an abomination unto the wicked (Proverbs 29:27) and therefore there is no way you can please the wicked. Righteousness exalteth a nation (Proverbs 14:34). Continue to pursue the path of righteosness and this nation would be exalted, and be filled and all our needs would be delivered to the glory of God (Proverbs 14: 34; Mathew 5:6; Mathew 6:33). Mr. Prez, good morning am happy for the medium given to ghahaians, but the unfortunate thing is do give us a listing hear, pls let us be getting your comments about our corcerns. I first of all thank God almighty for your Life because it is not easy to be alive. I always prayed that God whom you always mentioned,when you deliver your speech will be with you in everything you do till you win the 2012 election and make Ghana a best and not the better. Please stick to the truth dont let them drive you away from the truth Rawlings has ruled for twenty years and he did his best and it wasnt for us so he should allow you to do your best too. Please mr President dont listen to npp too about the projects that they have started and they could not complete please do well and finish them especially accra kumasi road that is from ofonko barrier. so please i know there are a lot of printing press in accra but we can also be given a little that would enable us to keep the press busy.Thank you mr PRESIDENT and i am hoping to hear from you or any of your ministers that may be of help to us. I am congratulating His Excellency the President of the Republic of Ghana; His excellency John Evans Atta Mills for his hard work, peace and patient he continue to commands no matter how things turning in our party.this Party really toil to take power from these NPPs. Why all these in NDC? We are one. Is my prayer that, whoever wins will get our support. But I know His excellency will make it again. I HAVE PROBLEM ABOUT GHANA EDUCATION SYSTEM. RECENTLY I BOUGHT AN ADMISSION FORMS FOR LEGON GTRADUATE SCHOOL TO ENROL AS AN M.PHIL FINANCE STUDENT. I HAVE ALL IT TAKES TO BE ADMITTED BUT THEN UPON ENQUIRES I FOUND OUT THAT THE PROGRAMME IS SOLLY RESERVED FOR LEGON TEACHING ASSISTANT STUDENTS. THE QUESTION IS, HOW ON EARTH SHOULD ADMISSION APPLICATIONS BE MADE PUBLICLY THAN THE STUDENTS ALREADY KNOWN? THIS HAS GOTTEN TO JOB POSITIONS THAT AN ADVERT WILL BE MADE BUT THE POSITION BEING ADVETISED IS NOT VACANT. PERSONALLY AFTER FIRST CLASS IN PSYCHOLOGY FROM UCC, NO JOB AND SEEKING ADMISSION THAN TO HEAR THIS, I THINK SOME OF US SHALL START WHAT THE SOCIETY MAY NOT LIKE. HOW ON EARTH SHOULD A COUNTRY BE CORRUPTED THAN TO AFFACT THE EDUCATION ADMISSIONS SYSTEM. I feel very strongly that the president is delivering in equitable terms.first ever in life of Ghana where we have this type of selfless leadership apart from founding father Dr.Kwame Nkrumah.I urge all Ghanaians to support the president and his ministers to achieve the feet that we are all yearning to see this country reach sooner than later.I wish the president and all well wishing Ghanaians Happy Easter and God's Blessing. i was very much happy when in the 2008 campaign season,you in one of his campaign messages said something about how this current administration was going to handle disabled people should the ndc come to power. in-fact for some of us we felt very happy that our prayers was coming to a realization. you and would wish you stand for the presidency in 2016 without any fear of the Rawlings.They are a disgrace to the NDC,you will floor her if she attempts to stand again in 2016.Your boss prof. has giving you enoungh training. Almighty Allah is seriously guiding you and the good old prof.You are my mentor. I have all my names correspond to yours but I changed my surname to reflect my religiou believe. However, i encourage you to look at the problems in the Gonja areas too.Plse forgive me if you think i sound tribalistic its not the intention. I only want you to get a strong support of your kinsmen.Also Radio and TV receptions are so poor in the Gonja areas. They are restrict on only one station, GTV and unique. your excellency, i have seen all the effort of this current administration to make the agricultural sector of the economy attractive, especially to the graduands youth of the country.am talking as a young graduate from one of the tertiary institutions in the land who decides to go into aqua culture with about 6000 spices of cuttfish from self financing source.but your excellency i stand to be corrected, most of your (government) polices is to provide grants and other forms of financial assistance to the youth to start or expand their aqua farming, but who buys the end product from the farmers?,at what price?, and who determined the price?. we would be more productive when we are also, given a similar platform to sell our product to the government at a standard price like those in the cocoa,sheanut,coffee and so on industries. this would take away the buyer determine the price for the fish farmer as result of non-availability of market.Unlike those on the other hands of agriculture, we do not get subsiduce on our inputs like the feed which is about GH40.00 per a bag. Thank you, our 2016 president(prophecy). The Gov't cannot do dis all by himself, but should seek de Expertise, Skills, Money, en de Know-How from its citizens Abroad, by putting down structures to invite all hands on deck, By establishing 24-7 INTERNET F.M. RADIO PLATFORM TO BRING OUT WHAT DE Ghanaian Diaspora have acquired outside on, Table to Better our Nation Ghana. Stevom-Holland. www.ghanadiasporafund.com contact our stand-by Think-Tank Group stevom@europe.com 0031613501416 . I love this site but want to make an appeal to the president about nurses.Nurses undergo a three years program and pay ¢500 and above per semester.Nurses also pay ¢200 for licensing exams after the three years program and most nurses are failed after writing the licensing exams despite the shortages of nurses in the country and the cost of training. Most tertiary schools after writing their end of semester exams they graduate but student nurses are made to write extra external exams like second cycle schools do and without graduation at the end of training. Its a pity how nurses are train here in GHANA,failure rate of nurses compared to pass rate is nothing to write about but yet still we complian about inadequate nursing staff what a shame.Mr President and follow executives please do something about nursing training in GHANA. THANK YOU. Mr president, my concern is on our EDUCATION system for the technical and the vocational schools graduate. With the better Ghana agenda I think we also have to be considered. HI,am very grateful with the Bole senior high school ICT LAB which has just being commissioned by H.E THE VICE PRESIDENT OF THE REPUBLIC OF GHANA JOHN DRAMANI MAHAMA . Mr vice president, the success of your government depends on the effort put by District chief Executives.especially in the rural areas like sampa and its environs. Please monitor the activities of the DCEs very well since most of them don't know anything about management. Please select DCEs with management background so that they can effectively contribute to the better Ghana agenda. please, set a monitoring team under every Regional Minister to go round and see with their naked eyes the projects most DCEs claim they are undertaking.Secondly, Mr vice president, Diploma nurses are now asked to serve mother Ghana for 12months without salary while other Diploma students receive a huge lump sum of money as back pay at the end of their first year of service.Consider this else it will be a disaster for our party in 2012 since junior nurses are always saying negative things about our party. In fact we are tired of the insults. Thank You for the opportunity. Hello my president,please i want to know all your current ministers and their respective positions.Please if i could get this list by the close of the day i will be happy since i am writing exams tomorrow on foreign affairs.THANK YOU MR PRESIDENT.